I know that hand-knitting my own washcloths might make me old school, but I have a confession to make: loofas gross me out. Have you ever thought about how many germs are probably growing inside those puffy things? They never fully dry. Eew. Anyway, that's why I decided to knit myself a bright and happy set of washcloths that I can throw in the laundry any time I want. Want to knit them too? The pattern I made up is super easy. I used double seed stitch with a garter stitch border, so as long as you know how to knit and purl you can totally make these. If you make these washcloths too, I'd love to see a picture of yours! These are totally awesome! I'm book marking these to make myself some for my next project (i'm currently in fingerless gloves land for a few more pairs of gloves as gifts and then I'm knitting IC a sweater!). they're so cute, I love the colors ! Very cute!!! I might have to make myself some!! Did you use just one skein per washcloth?? They also make great dish cloths! Adorable......I just was searching for a "new" pattern for these as I love to be creative. Thanks for sharing!! I let everyone know on Facebook that this was my next project and would anyone like some washclothes. We'll see. Thanks for the pattern. Are you by any chance knitting your scarf in stockinette stitch? Stockinette stitch naturally curls up. 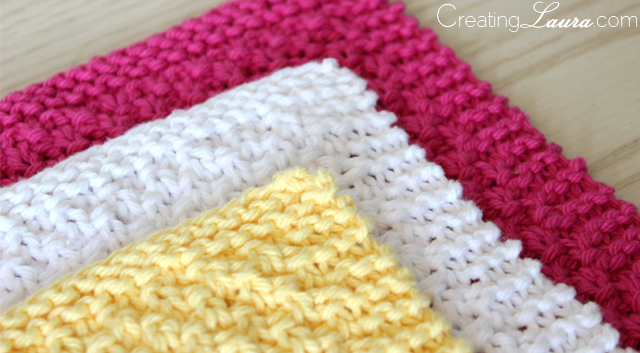 These washcloths lay flat because they have a combination of knit and purl stitches on each side. I love these. I knit but I am not sure what the purl stitch is. Can you tell me? I just got my dishie yarns in the mail today and can't wait to get started. Thanks for the pattern! How do you add the garter stitch boarder? It's built into the pattern; you don't have to add it later. That's why the first 3 stitches and the last 3 stitches in every row are knit stitches no matter what else it happening in that row. 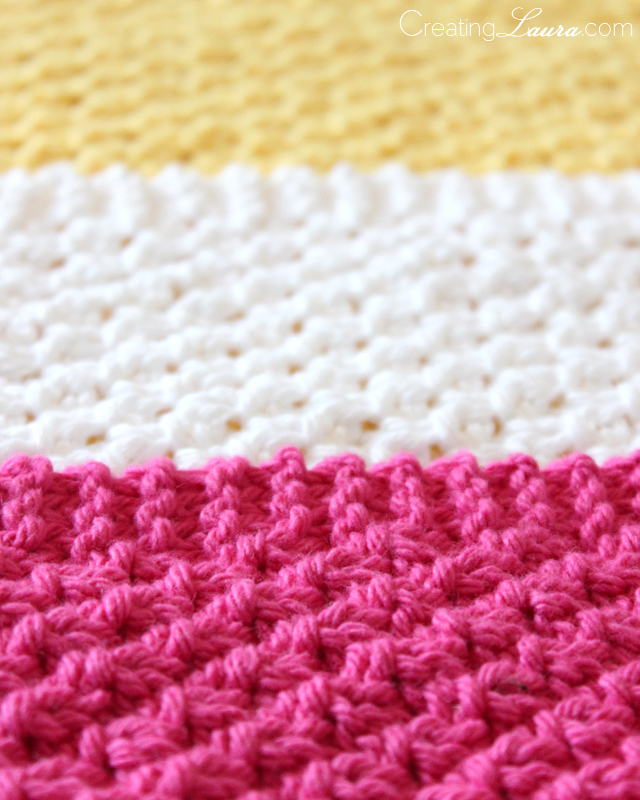 Those knit stitches form the garter stitch edging. hey, great pattern. just a quick question- it looks like you need to cast-on an even number of stitches for it to work. 35-6 (3 on each end) leaves you with 29 stitches and that leaves you with 4 stitches at the end instead of 3. am i reading it wrong? help. :) thanks! Hi Laura, Thanks for the thumbs up to my pre washing idea. I was wondering, if it wouldn't be too much trouble, if you would give me the measurements of the finished washcloths before and after laundering. Thanks so much for such a great blog!!!! I never prewash, but be sure you use 100% cotton yarn. 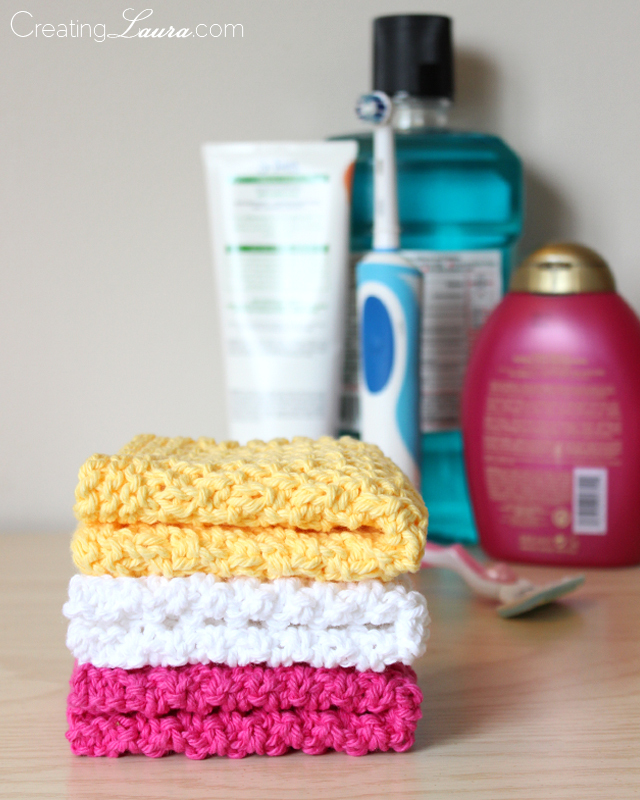 I love making washcloths and they make wonderful gifts for any occasion. I also love this pattern. Going to do it next . I am also making great crochet luggage tags. Can you post a pic of a close up on finished product? I'd like to see how the stitches look, it'll be easier for me to see when I start it. May use this to teach my 12y/o how to knit, one can't ever be without too many wash clothes! Thanks for sharing your pattern, love the texture which is always nice in a knit cloth. I made this washcloth it was super easy and super fun. Not sure how to post a picture of it. Hey Laura, just wondering what bind off you used for this? Thanks!